Recently we got a chance to have a Q/A session with Salil Desai. He is the only contemporary Indian author who write police procedural in English. Inspector Saralkar series authored by him got critical and commercihal success. Well I am an author, columnist, management film-maker and media trainer. Here is the entire interview with a note that we have intentionally avoided many questions which are already answered by Salil in various other interviews. I began writing for newspapers while in college, completed by post-graduation at Symbiosis Institute of Media & Communication in 1991 and for the next 10 years was a corporate executive handling advertising & PR in various companies. Then in 2000, I let my creative instincts take over and became a management film-maker through my own entrepreneurial venture Re-Living (www.relivingindia.com). In 2005-06 I completed my one year PG course in Television (Direction) from FTII and continued making management films but also started writing fiction again. In 2011, my first Inspector Saralkar mystery was published and since then I have written a total of 5 books – 4 murder mysteries and one short story collection. Meanwhile, I also started writing for newspapers regularly and am now a regular contributor to various dailies, especially The Tribune and Deccan Herald. I also conduct creative writing, script writing, feature writing and crime writing workshops at various leading institutes. I have also written a full-length film-script and have just completed my 6th book. So you see, writing is about all I do. I was also one of the 4 international authors selected for the HALD International Writers’ Residency in Denmark, hosted by the Danish Centre for Writers & Translators in June 2016. I love reading, traveling and watching movies. I think I express myself best when I write. It’s an urge, it’s a flair and it’s a craft that enthrals me completely. In some ways writing has become a habit, a sort of second nature. I also never stop feeling thrilled in seeing my name in print – whether it’s on a book cover or an article or a film script. Is there anything specific which made you to take Police Procedural as your writing canvas? I have always been fascinated by true life crime and the actual catching of a criminal, through painstaking investigation and police work, because of the fallibility involved. That’s why I chose the format of a police procedural, because I was convinced that fictional realism is a very powerful story-telling tool, when blended with dark humour. Besides, as I have mentioned in many interviews, I made a documentary on Maharashtra CID in 2005-06 and that gave me a very good feel of how crime is investigated by the police. We have seen in Inspector Saralkar Mystery series that you weave the current happenings in the book quite nicely, and you make an attempt to rename things (eg. Secrets Of Living – as the name of the program, OR Rangdev Baba as a character). Are your main character names also inspired from some real life characters? (For example Dan Brown‘s Robert Langdon is inspired by John Langdon – a graphic designer)? Can you share your thought process of naming characters? My main characters are a combination of several people rolled into one. This applies to Saralkar and Motkar and many other characters in my books. This is a technique which has worked for me perfectly, where I take the looks and features of one person, the attitudes and outlook of another, mannerisms and tastes of a third and so on and create a unique character out of him / her. One thing I religiously follow is that when I am constructing a character from real life, I basically borrow only the essence of the person – the orientation – and then dress him or her up in a completely different outer shell. As regards naming characters, honestly, I just play around with combinations of names, depending on the type, regional ethnicity, age, background etc. and then suddenly something fits perfectly for the particular character. By the way, what is the first name of Inspector Saralkar 🙂 ? Ha! Ha! It will be revealed in one of my books and so I prefer to keep you in suspense. Sometimes, when you revisit your own work, do you feel that you could have done justice to a specific character by giving him / her some more exposure? For eg. Do you think that in “The Murder Of Sonia Raikkonen“, you could have shown some relief from the trouble for Badri Tiwari? Well yes and no. I often get mails or suggestions from readers about a certain character in one of my books. I do try to give each character some closure, but only to the extent that it has relevance to the main storyline. Real life is messy – so stories and character graphs cannot be completely neat. As a reader, you might want something good to happen to Badri Tewari, as you mentioned, but I believe the unfairness of life comes through because I don’t provide relief to him from his ordeal. For a lawyer like John Grisham it is quite easy to get the process details in his legal thriller. How do you research and depict the Police Procedural details in the books in an interesting manner while retaining their authenticity as well? Research, a good understanding of how the system works, a genuine interest in real crime, common sense and keeping yourself updated is how I go about working on the police procedural aspects of my book. Making it interesting is where my craft as a writer comes in, and I follow the good old technique of making sure I get the dosage right – how much detail is required for authenticity and most importantly the book should keep the reader captivated by keeping the story moving. Also I pay a lot of attention to dialogue and conversation and keep a tight leash on description. Inspector Saralkar series have a good potential to be converted into a Movie series, which are the actors you think are suitable for key roles? And who should direct the movie(s)? Tough question about who should play the roles of Saralkar and Motkar. I would love a team of Kamal Hassan and Nawazuddin Siddique and Sriram Raghavan as Director. Non-fiction, true crime, 19th and 20th century history, especially World War II and Indian Independence movement, crime fiction and any other book which traverses popular and literary fiction. I have been reading all kinds of stuff in the last few months. Tell us about your articles and topics which are published at regular intervals in various media. Well I write regularly as an op-ed columnist for The Tribune as well Deccan Herald. Most of the times I write on social and political issues, cinema, books, journalism and other contemporary topics. I also write features and most of the time these are travelogues or pieces on Indian and foreign cinema. Can you share your experience of the journey from writing the book to get it published, especially for your first book? Every book is a different journey. Sometimes you have it all planned out, sometimes you know only some part of the way and then get lost, find your way back and continue. Sometimes you begin beautifully and then suddenly get stuck for weeks wondering what happened, like a batsman who’s suddenly lost form. Sometimes you write superfast, sometimes so slow that you wonder if you’ll ever finish the book. All I can say, its bloody hard and sometimes you feel euphoric and at other times exasperated. Mornings mostly upto noon. I am a fairly good combination of method and spontaneity. I am quite disciplined and yet I am no slave to method. When I write, my only objective is to be entertaining, interesting or meaningful – and I try to achieve that through trial and error – craft or spontaneity. I really don’t know. Sometimes I think so when I see so many people not reading. But then lots of books are being published and lots of people are buying them. I think what’s happened is that reading requires effort, patience and the use of your mind. It’s not a lazy activity, whereas many other modes of entertainment – movies, TV, games, etc. require you to be only passive. You are quite vocal about your opinions as we have seen on your Facebook page, and even in your articles. If we limit it to the movies only, which are your favourite movies, and which was the one you had seen last? I think the last two movies I saw recently was “Dangal” in Hindi and “Going In Style” – English. I am a big movie buff and I literally have a huge list of favourite movies both Hindi and English. If I were to pick two each, they have to be “Sholay” and “Chupke Chupke” in Hindi and “The Great Dictator” and “Schindler’s List” in English. Thanks, Salil. We wish you the best in your future endeavours, and look forward to more interesting books from you. We found him very clear in his thoughts about what he wanted to talk about and prompt in responding. This is probably most professional interview we have conducted so far. 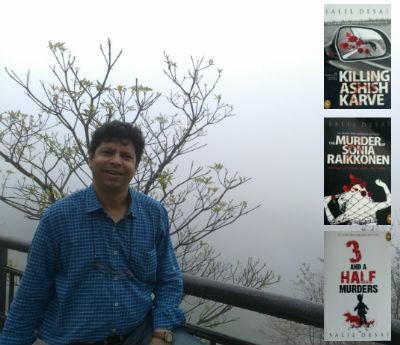 If you love police procedural or crime thrillers Salil’s books are a treat to go for.